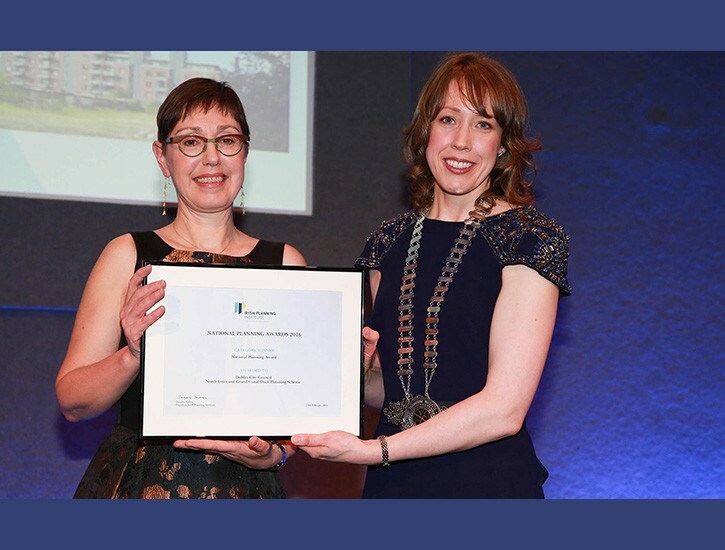 A landmark planning scheme to regenerate Dublin’s Docklands – bringing new communities and businesses to the area – has won the overall national award at this year’s National Planning Awards. 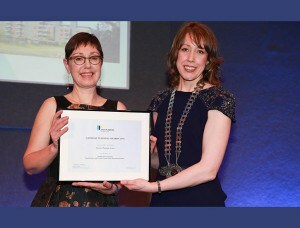 Deputy City Planner Mary Conway accepts the Overall Winner Award for the North Lotts and Grand Canal Dock Planning Scheme from Irish Planning Institute President Deirdre Fallon. The North Lotts and Grand Canal Dock Planning Scheme by planners at Dublin City Council is the biggest urban redevelopment and regeneration project in the history of the State and is now seeing multiple planning permissions being granted across the area. The North Lotts and Grand Canal Dock masterplan was approved by An Bord Pleanála and will provide for 2,600 residential units and up to 360,000 sq. metres of office space, as well as retail, community and public amenity facilities which will create 23,000 jobs. The winners are being announced tonight at the Irish Planning Institute (IPI) National Planning Awards in Dublin. IPI President Deirdre Fallon said the winning entry represented the challenges Ireland has faced in its economic crash and how best to overcome development and regeneration challenges. Other winners of note include Fáilte Ireland for the Wild Atlantic Way tourism brand which coordinated a tourism route stretching approximately 2,500km along Ireland’s Atlantic coast. The Wild Atlantic Way won the Tourism and Economic Development category and was commended for showing the opportunities for coordinated regional development and also its focus on balanced economic growth. “The Wild Atlantic Way represents a truly regional planning initiative. We welcome its scale, stakeholder and local authority engagement and ambition and commend its emphasis on balancing economic growth with protecting and enhancing the authenticity of the wild and natural environments,” the Judges said. A voluntary community group in Ballina Killaloe won an award in the Opportunity and Empowerment category. The Clarisford Park facility is developed and operated by Ballina Killaloe Sports and Recreational Facilities Development Ltd. to address a lack of amenities in the local area. Community volunteers developed and operate a facility consisting of playing fields and training pitches, a running / walking trail, sports hall and community park in Ballina Killaloe. “This is an excellent example of community led infrastructure provision and was developed following positive engagement with Clare County Council, elected members, planners and local groups and clubs. Clarisford Park’s multifunctional approach is an excellent model of maximising the use of scarce land and resources, avoiding duplication and empowering and connecting communities. It is a model for the development of future community sports facilities,” the judges said. The President’s Choice Award went to Fingal County Council for training in planning and mapping skills it has provided to planners in Lesotho. For the past three years Fingal County Council been working to upskill local planners in the use of planning practice and state of the art information and mapping systems, with a particular focus on climate change. IPI President Deirdre Fallon said the project has involved formal training of all urban planners in Lesotho and has also mapped the whole country using the latest GIS planning systems. IPI has also taken part in the project by helping to establish a new national planning Institute in Lesotho.